In December, junior Lexi Meola earned her fourth-degree black belt in taekwondo. 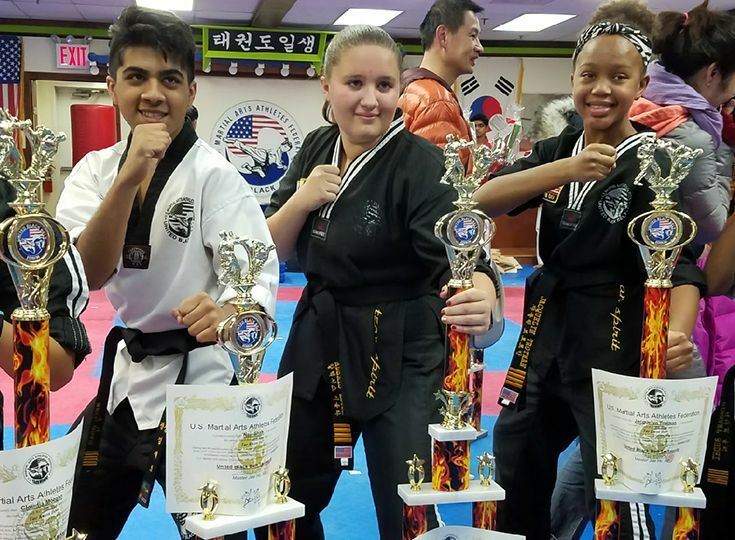 The 16-year-old has been practicing the martial art for the past 10 years, beginning at the age of six when her grandmother enrolled her in a class at United Taekwondo in Edison. "I had no idea how much I would grow to love it," she says. "Kudos to my grandmother for introducing me to it and for my family for helping me stick with it." At the age of six, Meola was also taking classes in ballet. "I enjoyed being on stage during the performances, but I didn’t really like much else," she confides. "I’m not a ballerina, although I learned from ballet that I enjoy the stage. That inspired me to become involved with acting and singing." At GSB, Meola sings with the Upper School choir and will be appearing in the spring musical Into the Woods. Earning a black belt takes time and dedication. At present, Meolo attends classes at her studio on Friday evenings and Saturday mornings—times that do not interfere with her academic work and extracurricular commitments at Gill. During the summer, she adds Monday and Wednesday classes to the mix. In addition, she serves as a junior instructor at United Taekwondo—something she has been doing since earning her first-degree black belt several years ago. Currently, Meolo holds two junior-instructor patches, and she hopes to earn her second-level instructor’s patch this summer. "You have to teach 100 hours to qualify for the second-level patch," she explains. "At this point, I have about 50 hours. With the class I teach on Friday nights plus additional classes in the summer, I should be able to get there." For Meola, serving as an instructor is one of the most rewarding aspects of having achieved black-belt status. "I love working with kids," she says, "and it is great to be able to pass on something that I love." She notes there is still a significant gender gap in the martial arts, so she particularly enjoys teaching girls the sport. "When I first started, I was the only girl in a class of about 10, and the instructors were all men. So, when I see a six- or seven-year old girl taking the class, I want to be the best role model for her that I can and show her that there is nothing stopping her from excelling at taekwondo."